Even before he was born into this world, Mickey Mantle was being prepared for life as a future big-league baseball player. His father, Elvin “Mutt” Mantle, a former semipro player and a lifelong baseball fanatic, proclaimed that if his first child turned out to be a boy, he would name him Mickey, in honor of Mickey Cochrane, who was the best catcher in baseball at the time. By the time Mickey was 3 years old, the country was mired in the Great Depression. Like so many other able-bodied men, Mutt Mantle found himself unemployed and nearly broke when he moved the family to Commerce, Oklahoma, in 1934. Mutt had been lucky enough to land a job working in the Eagle-Picher company’s lead and zinc mines. The work was exhausting, dirty, and dangerous. Those who worked for many years at the plant were at risk for lung disease, heart ailments, and cancer. In fact, cancer had been the grim reaper of the Mantle family, claiming among others, Mickey’s uncle, his grandfather, and a couple of other relatives, all in their 40s or younger. Despite this brutal and exhausting work life, the elder Mantle still found time to play baseball on the weekends and, when the time came, to teach his son the game. Mickey also loved to play football, but an injury early in his freshman year of high school prematurely ended his budding pigskin career – and almost his life. During a football practice he was kicked in the lower leg by a teammate. Within hours his ankle had swollen to three times its normal size, and he developed a 104-degree fever. His parents took the 14-year-old to the local hospital, where doctors diagnosed him with osteomyelitis, a potentially fatal bone disease that had been aggravated by the injury. Doctors told the Mantles that they had to amputate the leg to save the child’s life. Mickey’s parents sought a second opinion at the Crippled Children’s Hospital in Oklahoma City. Doctors there agreed that he had osteomyelitis, but they had a much less drastic treatment plan: eight shots a day of a new wonder drug called penicillin. Within a week the swelling in Mickey’s ankle dissipated, and he was soon back in sports. His football career was over, but his baseball life was just beginning. By the time he was 15, Mickey Mantle was playing semipro ball with the Baxter Springs Whiz Kids, a local team of miners, former high-school stars, and even a former minor leaguer once in a while. One day late in that 1948 season, a New York Yankees scout named Tom Greenwade came to Baxter Springs to evaluate one of Mantle’s teammates, a third baseman named Billy Johnson. But his focus quickly turned to the 16-year-old shortstop, who hit two long home runs, one right-handed and one left-handed. Both landed in a creek well beyond the outfield fence. After the game Greenwood approached Mantle and asked: “How would you like to play for the Yankees?”4 Mickey and his father were both stunned at first, but soon became excited about the prospect of Mickey becoming a Yankee. Greenwade explained that because Mickey was only 16 years old, he would have to wait until he graduated from high school before the Yankees could sign him. Sure enough, when Mantle graduated the next spring, Greenwade offered him a contract to play for the Yankees’ Class D minor-league team in Independence, Kansas. He received a $1,100 signing bonus and a salary of $400 for the rest of the season. In 1949 he hit an impressive .315 for the Independence Yankees in the Kansas-Oklahoma-Missouri (KOM) League. When the season ended Mantle returned home to Commerce to work with his father in the zinc and lead mines. One weekend he met a high-school senior named Merlyn Johnson, and the two began dating regularly. 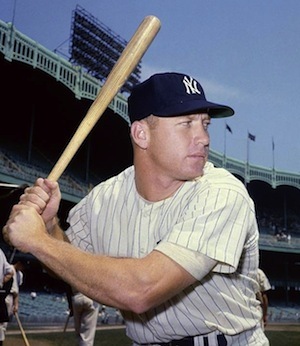 Mantle got his first taste of major-league life when the Yankees called him up on September 17, 1950. Although he rode the bench for the remaining few days of the season, the 18-year-old nevertheless traveled and took batting practice with the team. He observed the likes of Joe DiMaggio, Yogi Berra, and Phil Rizzuto as they were locked in a pennant race with the Detroit Tigers and Boston Red Sox. When Mantle arrived at spring training in 1951, clubhouse manager Pete Sheehy gave him uniform number 6, the implication being that Mantle was expected to be the next great Yankee, and therefore should succeed Ruth (uniform number 3), Gehrig (4), and DiMaggio (5). “The law of mathematical progression,” Yankees public relations director Red Patterson later called it.5 Mantle never liked the number or the expectations it raised. Joe DiMaggio increased the heat when he announced on March 1 that 1951 would be his final season. The next day, manager Casey Stengel announced that Mantle would be the Yankee Clipper’s successor. Despite the heavy expectations suddenly thrust upon him, Mantle flourished in spring training, hitting prodigious home runs in batting practice and leaving teammates in the dust during running drills. The decision crushed Mantle. Three months earlier, he was being touted as the next Ruth, Gehrig, and DiMaggio all rolled into one. Now he was going back to the minors, to the Yankees’ Triple-A affiliate in Kansas City. Things were about to get worse. In his first 18 at-bats in Kansas City, he managed only three hits, one of them a bunt single. He grew lonely and despondent, believing that his career was over before it had a chance to begin. Mantle later said that it was “as though Mutt had leveled a double-barreled shotgun at my head.” Mutt proceeded to pack up Mantle’s belongings, all the time grumbling that “he thought he raised a man, and you’re just a coward.”9 When the time came to leave, Mickey broke down crying and told his father that he would give it another chance. The incident lit a fire under Mantle, who went on a tear for the next month. By late August, after playing 40 games for Kansas City, Mantle was batting .361 with 11 home runs and 60 RBIs, and was recalled by the Yankees. Upon his return, he was assigned uniform number 7, which he would wear for the next 18 years. In the final 27 games of the season, Mantle hit .284 with six home runs and 20 RBIs. The Yankees clinched the American League pennant on September 28 and faced the crosstown New York Giants in the World Series. In the fifth inning of Game Two, Giants rookie Willie Mays hit a fly ball toward right-center field, halfway between Mantle and DiMaggio. Mantle sprinted toward the ball and so did DiMaggio, each looking up as they closed in for what appeared to be a certain head-on collision. Just before Mantle reached the ball, however, he heard DiMaggio call, “I got it.” Mantle stopped short from a full sprint, and in doing so, caught his spikes on the rubber cover of a drain pipe in the outfield and dropped to the ground. Fans and players who saw him collapse from a distance said that it looked as if Mantle had been shot. Writhing in pain on the outfield grass, he was comforted by the usually cold and aloof DiMaggio: “Are you all right? Don’t move. They’re bringing a stretcher.”10 Trainers rushed to the scene and carried Mantle off the field amid the eerie silence of a stunned crowd. On the way out of the stadium, Mutt Mantle was trying to help Mickey into a taxi that would take him to the hospital, but when Mickey leaned his full weight on his father, Mutt fell to the ground. Father and son were taken to the hospital together, and given side-by-side hospital beds in one room. Mickey had torn ligaments in his knee, and needed surgery. Mutt had Hodgkin’s disease. The two watched the rest of the World Series from their adjacent hospital beds. Mantle had surgery and was sent home to heal. Mutt was given a grim prognosis and sent home to die. He was 39 years old. It was another example of what Mickey called the “Mantle Curse.” Cancer had claimed his grandfather and two of his uncles well before their time, and now it was going to take away his father. For the rest of his playing days, Mantle told friends, he believed he would also die young. This belief haunted Mantle throughout his life, and was among the many pressures that led to much of his self-destructive behavior. But not all was doom and gloom for Mickey. On December 23 he married Merlyn Johnson in Commerce. Just 20 years old, Mantle had grown up quite a bit in just one year: from teenage phenom to rookie bust to the World Series injury to Mutt’s terminal illness to life as a husband. Mantle improved in 1952, batting .311 with 23 home runs and 87 RBIs. The Yankees won their fourth straight pennant and beat the Brooklyn Dodgers in another memorable World Series. Mantle homered twice, and the Dodgers Jackie Robinson gave him much of the credit for the Yankees’ victory. In those days before instant replay, electronic measuring devices, and landmark distances carved into outfield concourses, no player’s home runs generated more stories, controversy, myth, and legend than those hit by Mickey Mantle. It had gone all the way back to the day that Tom Greenwade discovered him in 1948. Mantle’s most colossal home run came in his third season, on April 17, 1953, off Chuck Stobbs of the Washington Senators at Griffith Stadium. The Senators’ home park was decidedly pitcher-friendly. The left-field foul pole was 405 feet down the line. Behind that wall was a grandstand that extended 65 feet until it reached a massive sign advertising National Bohemian Beer, which prominently featured the one-eyed, mustachioed face of “Mr. Boh,” who was the mascot for the brew. Batting right-handed, Mantle drove Stobbs’ second pitch high and long and incredibly fast. The sphere easily cleared the left-center fence and blew past the 55-foot-high Mr. Boh sign, clipping off his mustache and continuing its flight over the rooftops of houses across neighboring Fifth Street. Estimates of the length were between 540 and 565 feet. In addition to impressive displays of power for such a young player, Mantle continued to improve in all aspects of the game in 1953. He ended the season with a .295 batting average, 21 home runs, 92 RBIs, and 105 runs scored. At just 21 years old, Mantle had already become a key element of a historic team that captured a fifth consecutive American League pennant. It was a new major-league record, surpassing the Yankees from 1936 through 1939, and the Giants from 1921 through 1924. In the National League, the Brooklyn Dodgers won their second straight pennant and set up a fourth Yankees-Dodgers World Series in seven years. The Yankees won once again, this time in six games. Overall, Mantle hit only .208, but he homered twice. One was a grand slam in Game Five. In 1954 Mantle hit .300 with 27 home runs, 102 RBIs, and a league-leading 129 runs scored. The Yankees won 103 games, but they couldn’t keep pace with the Cleveland Indians, who won an American League record 111 games. The Yankees bounced back and won the pennant in 1955, and once again faced the Brooklyn Dodgers in the World Series. This time the Dodgers prevailed, winning an unforgettable seven-game Series. Once again Mantle’s World Series was plagued by injury, a hamstring pull that limited him to three games. He homered in Game Three, but was otherwise ineffective, batting .200. As disappointing as the end of the season was, Mantle soon had reason to be happy. The tight-fisted general manager George Weiss almost doubled his salary, from $17,000 to $33,000, an amount that made him the second highest paid Yankee. The investment paid off as Mantle won the 1956 Triple Crown, leading the major leagues in batting average (.353), home runs (52), and RBIs (130), led the league in runs scored with 132, and was voted the AL’s Most Valuable Player. The Yankees defeated the Dodgers in seven games in the World Series, which was highlighted by Don Larsen’s perfect game. Mantle slammed three home runs, walked seven times, scored six runs, and drove in four. Despite the always-present nagging injuries, Mantle continued to thrive over the next four seasons, winning a second MVP in 1957, another home run title, and two more pennants. After a disappointing third-place finish in 1959, the Yankees bolstered their offense by acquiring Roger Maris from the Kansas City Athletics. The Yankees saw Maris, a left-handed pull hitter, as tailor-made for Yankee Stadium, with its 296-foot right-field wall. They turned out to be right. With Maris and Mantle both in the lineup, the Yankees bounced back to win the pennant in 1960. Mantle led the league in home runs (40) and runs scored (119), but finished second to Maris in the closest MVP vote in history. Mantle had an incredible World Series, batting .400 with three home runs and 11 RBIs, but the Yankees lost to the Pittsburgh Pirates when Pittsburgh second baseman Bill Mazeroski drilled a dramatic walk-off home run in Game Seven. During the summer of their famous 1961 home-run chase, Mickey Mantle was the media favorite to win the race, the one most New York sportswriters considered the “Real Yankee,” a player who was worthy of the record. Maris, often portrayed by the media as sullen and surly, was seen as an outsider, an interloper who was trying to steal the crown from the rightful heir-apparent to the Babe. The two ran neck-and-neck all season, and on September 10, with 18 games remaining, Maris had 56 home runs and Mantle had 53. But the anticipated final stretch race was not to be. Mantle had been suffering from severe muscle stiffness and soreness for weeks, and then he developed a bad cold, which sapped his energy and knocked him out of four games from September 19 to September 22. He returned to action in Boston on September 23, and in his first at-bat against Don Schwall, he belted home run number 54. But the next day, Mickey went 0-for-3 before being removed in the sixth inning because of his illness. Overall, Mantle missed ten of the Yankees’ final 12 games. He finished the season with 54 home runs, and as with many of Mantle’s accomplishments, there remained the question of what could have been. Would he have hit six or seven more if he had been healthy over the last two weeks of the season? Perhaps. Perhaps not. Roger Maris, on the other hand, did reach 61, his final shot coming in the Yankees’ last game of the season as Mantle watched from his hospital bed. Doctors finally released Mantle from the hospital on October 2, but he played in only two games in the World Series against the Cincinnati Reds. It didn’t hurt the team, though. The Yankees took the Series in five games. Although Mantle missed 39 games in the 1962 season, he still managed 30 home runs and 89 RBIs. He finished second in batting average (.321), and won his third MVP award. The Yankees won the World Series against the San Francisco Giants in seven games. That winter, the Yankees reached deep into their pockets and gave Mantle a $100,000 contract. It made him only the fifth player in history to earn a six-figure deal, joining Ted Williams, Joe DiMaggio, Stan Musial, and Willie Mays. Mantle began the 1963 season just as he’d ended the previous year, hitting for average and power. After 36 games he was batting .310 with 11 home runs and 26 RBIs. One of those home runs came on May 22 at Yankee Stadium against Kansas City. The Yankees and Athletics were locked in a 7-7 tie heading into the bottom of the 11th inning. Batting left-handed, Mantle hammered a Bill Fischer fastball off the façade on the right-field roof just two feet from the top. Mickey said it was the hardest ball he had ever hit. For years fans, pundits, eyewitnesses, scientists and charlatans have debated just how long the ball would have traveled if it hadn’t struck the façade. Estimates vary from 475 feet to 734 feet, with the more credible ones in the mid-500s. But on June 5, 1963, the injury curse struck Mantle again. In a game against the Orioles in Baltimore, Brooks Robinson hit a fly ball over Mantle’s head. Mickey chased the ball in its flight as it sailed toward the wall, jumped, and crashed into the chain-link fence as the ball sailed over the wall. As perhaps only Mickey Mantle could do, he hooked his cleats in the chain-link fence, and as his body hit the fence and ricocheted back, causing the front part of his foot to bend violently up and back. Mantle had broken a bone in his foot and was fitted with a knee-high plaster cast, within which he would remain imprisoned for more than a month, and which kept him out of 61 games. In all, Mantle played in 65 games in 1963 and had 213 plate appearances. He hit .314 with an on-base percentage of .441 and a slugging percentage of .622, statistics far better than those of the official league leaders. Another truncated season probably didn’t make the Yankees brass too happy, but Mickey Mantle still had star power. He was the most popular Yankee, the team leader, and the face of the franchise, all of which earned him another $100,000 salary for the 1964 season. Mantle paid dividends in 1964, staying healthy and batting .303 with 35 home runs, 111 RBIs, and a league-leading on-base percentage of .423. The Yankees won their fifth straight pennant, but lost to the St. Louis Cardinals in a seven-game World Series. 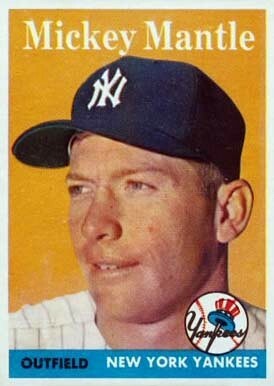 It was a bitter disappointment for Mantle, who had a great Series, batting .333 with eight RBIs. His three home runs gave him 18 World Series homers, a record that still stood as of the 2011 World Series. Mantle turned 33 on October 20, 1964. Not yet old for a ballplayer, and though Mantle had been oft injured and fragile throughout much of his career, he was coming off a great season and an even better World Series. But the 1965 season was not kind to Mantle. Years of injuries, late nights, and excessive alcohol consumption may have aged him before his time. He batted a mere .255 and the Yankees finished sixth in the American League, their worst finish in 40 years. And so Mantle played on, his numbers declining over the next two seasons, his batting average dipping to .237 in 1968, and his career average dropping below the magical .300 level, something once unthinkable for Mantle. But there were also highlights in those late seasons. On May 14, 1967, Mantle hit his 500th home run, off Stu Miller of the Orioles in Yankee Stadium. He was tied with Jimmie Foxx for fourth place in career home runs with 534 when he faced Denny McLain at Tigers Stadium on September 19, 1968. The Tigers had clinched the American League pennant two days earlier, and led the Yankees 6-1 when Mantle came to the plate in the top of the eighth inning. Mickey Mantle played his last game at Yankee Stadium on September 25, 1968. Three days later he played his final career game. On March 1, 1969, exactly 18 years after Joe DiMaggio had announced that 1951 would be his final season, Mantle announced his own retirement from the game. On June 8 the Yankees held Mickey Mantle Day at the Stadium. More than 70,000 fans attended the ceremony, during which Mantle’s number 7, was retired, adding him to the legendary players who’d already had their numbers retired (Ruth, Gehrig, and DiMaggio). Mantle finished with a career batting average of .298. His 536 home runs ranked third all-time when he retired and remain the 16th most in history as of the end of the 2011 season. He collected 1,509 RBIs, and scored 1,676 runs. Mantle was a better hitter from the right side than the left. From the right, he hit .330 with an OBP of .424 and a slugging percentage of .575; from the left side, he managed a .281 batting average, a .418 OBP, and a .546 slugging percentage. On January 16, 1974, Mantle was elected to the National Baseball Hall of Fame with 88.2 percent of the vote. On August 12, 1974, he was inducted into the Hall with his friend and teammate Whitey Ford. Mantle struggled to find a new career after retiring from baseball. He served as a Yankee first-base coach in 1970, but abandoned that rather quickly. He invested in a hotel and a restaurant chain, both of which eventually failed. In 1983, he was given a job in public relations with the Claridge Hotel and Casino in Atlantic City. Shortly after the press conference announcing his new position with the Claridge, Commissioner Bowie Kuhn banned Mantle from baseball because of his involvement with a gambling establishment. Kuhn had done the same thing to Willie Mays, who also worked for a casino in Atlantic City. In 1984, when Peter Ueberroth succeeded Kuhn, his first official act was to reinstate Mantle and Mays. In the mid-1980s Mantle became the prime beneficiary of the exploding market for baseball memorabilia, as baseball fans and collectors began shelling out huge sums for game balls, bats, uniforms, and other artifacts. Players’ signatures became a very hot commodity, and none were more sought-after than Mantle’s. He attended card shows and was paid better than any of his contemporaries. He didn’t forget his old teammates either, bringing them along with him to signing shows, where the likes of Moose Skowron and Phil Linz would sign more autographs and make a lot more money simply by sitting next to Mickey. After years of struggling financially, Mantle became a rich man through the memorabilia industry. He eventually earned more money signing baseballs than he did hitting them out of the ballpark. In 1988 he opened Mickey Mantle’s Restaurant on Central Park South in New York City. After several failed business ventures, Mantle finally had a winner. The restaurant was still there in 2012. It is no secret that Mantle abused alcohol from his very earliest days in the Yankee farm organization to almost the end of his life. Many of his drinking exploits while he was a player are well documented in other biographies and need not be covered at length here. Suffice it to say that Mantle was an alcoholic for all of his adult life. But his hard-drinking lifestyle eventually caught up with him. In 1993, at the urging of football player and close friend Pat Summerall, Mantle checked into the Betty Ford clinic in Los Angeles to seek treatment. After he emerged sober from the center, Mantle made a number of public-service announcements denouncing the dangers of alcoholism. He traveled the country spreading his message, and often saying that if it weren’t for alcohol, he would have been a better player and a better man. The “feel-good” story didn’t last very long, however. On January 7, 1994, Mantle was diagnosed with hepatitis, cirrhosis of the liver, and liver cancer. All his life Mickey had feared that he would be a victim of cancer like his father and uncles. It was the reason he often gave for his self-destructive behavior. He always thought cancer would get him, but it was his drinking, which served as his escapist behavior from the fear of an early death, that ironically led to his demise. On May 28, 1995, Mantle was admitted to Baylor Hospital with severe stomach pains. His liver was ruined and he needed a transplant, which he received on June 8. During the surgery, however, doctors discovered that the cancer had spread throughout his body. The transplant surgery was a success but Mickey was nevertheless given a death sentence. Two months later, on August 13, 1995, Mickey Charles Mantle died at the age of 63. His old Yankee teammates reunited at Lovers Lane United Methodist Church in Dallas for the funeral. Yogi Berra, Whitey Ford, Bobby Murcer, and Hank Bauer served as pallbearers, and carried Mantle’s body to its final resting place at Sparkman-Hillcrest Memorial Park Cemetery. Maury Allen and Bill Liederman, Our Mickey (Chicago: Triumph Books, 2004). Jane Leavy, The Last Boy: Mickey Mantle and the Loss of America’s Childhood (New York: Harper Books, 2010). Mickey Mantle and Herb Gluck, The Mick: An American Hero (New York: Jove Books, 1985). Dave Anderson, “Indians Top Yanks 3-2, Mantle Gets 522nd Homer,” New York Times, May 7, 1968. William J. Briordy, “Mantle Signs Contract for 1957 Season with Yankees for Reported $58,000,” New York Times, February 7, 1957. John Drebinger, “Mantle Named American League Most Valuable Player Second Year in a Row,” New York Times, November 23, 1957. John Drebinger, “Mantle’s Job Secure: Weiss of Yanks Says One Poor Season Does Not Mean a Player is Through,” New York Times, October 29, 1959. John Drebinger, “Mantle Is Hospitalized, But Yankees Expect Him to Play in World Series,” New York Times, September 29, 1961. John Drebinger, “Mantle’s New Yankees Contract Puts Him Above Ruth’s Salary Peak,” New York Times, December 14, 1961. Joseph Durso, “Mantle is Beset by Doubt About His Baseball Future,” New York Times, January 16, 1966. Joseph Durso, “McLain Wins No. 31 Despite Mantle’s 535th Home Run,” New York Times, September 20, 1968. Louis Effrat, “Towering Drive By Yankee Slugger Features 7-3 Defeat of Senators; Mantle’s 565 Foot Homer at Capital Surpassed Only by Mighty Ruth Wallops,” New York Times, April 18, 1953. Leonard Koppett, “Yankee Connects off Miller in 7th,” New York Times, May 15, 1967. Gilbert Millstein, “Young Mickey Mantle Finds Baseball is More Than Ball-Swatting,” New York Times, June 3, 1951. Joseph M. Sheehan, “Two Mantle Homers Spark 5-3 Victory: Mickey Moves Into a Tie With Maris,” New York Times, July 19, 1961. Joseph M. Sheehan, “Yankees Beat Tigers on Mantle’s 3 Homers,” New York Times, May 14, 1955. Gordon S. White, “Mantle Fractures Left Foot in Yank Victory at Baltimore,” New York Times, June 6, 1963. “Mantle Captures League Lead With Two Homers as Yankees Win,” New York Times, September 29, 1960. “Mantle Heads Both Leagues in Homers, Runs Batted In and Batting Percentage,” New York Times, October 1, 1956. “Mantle Is Beaten in 225-222 Vote, Maris Takes Closest Contest in Award History,” New York Times, November 9, 1960. “Mantle Measures Up to History,” New York Times, August 13, 1964. “Mantle Receives 3D Draft Physical,” New York Times, October 23, 1952. “Mantle’s Heroics Prove Cheers For Slugger Are Well Deserved,” New York Times, August 5, 1963. “Mantle’s Road to Fame: 18 Years of Pain, Misery and Frustration,” New York Times, March 2, 1969. 1 “Mantle’s Road to Fame: 18 Years of Pain, Misery and Frustration,” New York Times, March 2, 1969. 2 Mickey Mantle and Herb Gluck, The Mick: An American Hero (New York: Jove Books, 1985), 9. 5 Jane Leavy, The Last Boy: Mickey Mantle and the Loss of America’s Childhood (New York: Harper Books, 2010), 11. 6 The Last Boy, 13. 12 The Last Boy, 252. 14 The Last Boy, 277. 15 The Last Boy, 278. 16 The Last Boy, 292.